Inmarsat’s BGAN service provides simultaneous voice and broadband data communications globally from small and lightweight satellite terminals. 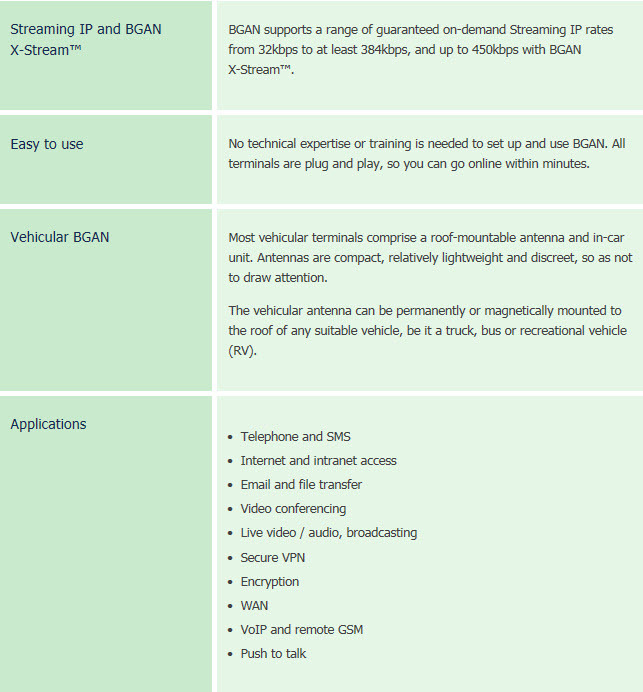 The BGAN terminal connects to a portable PC or smart device using Standard IP to access the internet for applications such as web browsing and email; or choose from a range of guaranteed Streaming IP rates to meet all your data, voice and video needs. 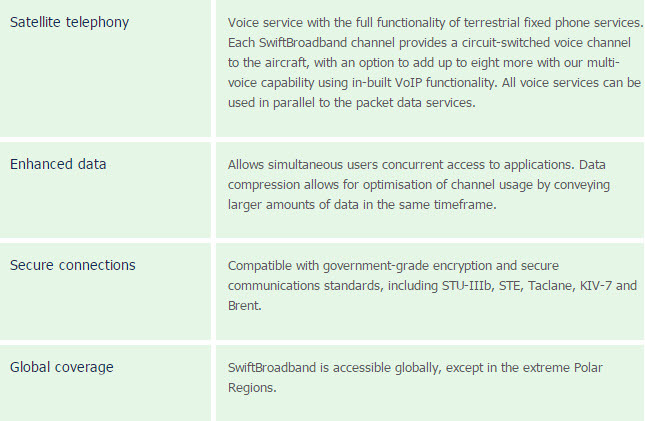 Swift Broadband provides global voice and high-speed data, simultaneously, through a single installation on the aircraft. It is an IP-based packet-switched service offering “always-on” data at up to 432kbps per channel. It can also provide IP streaming at various rates up to a full channel. Inmarsat’s L-TAC service has been designed with soldiers in mind to deliver robust, low-cost beyond-line-sight (BLOS) mobile communications. The service provides a UHF-like tactical satellite capability for use with existing military radios, without the need to modify radio hardware, for users on foot or in vehicles to communicate on-the-move. The service can be leased for a fixed period (minimum one month) and provides a complementary service to existing UHF/VHF SATCOM channel availability. The SlingShot applique, combined with Inmarsat’s L-TAC lease service, is fully flexible and designed to meet security and reliability requirements, cost effectively. Once deployed, remote management and support is provided through a 24/7 network operation centre.